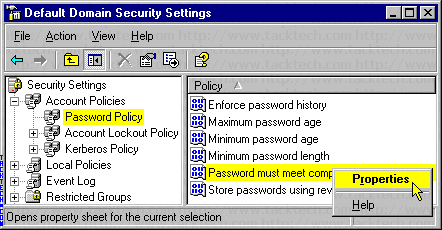 Change the strong password policy (Windows 2003) - TACKtech Corp.
1: Computers need to be more secure. 2: Users don't want to deal with security. 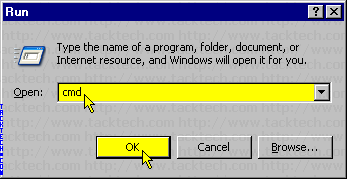 By default Windows Server 2003 requires passwords to meet the following criteria for strong passwords. Does not contain "Administrator" or "Admin"
Caution: Loosening password restrictions decreases security. 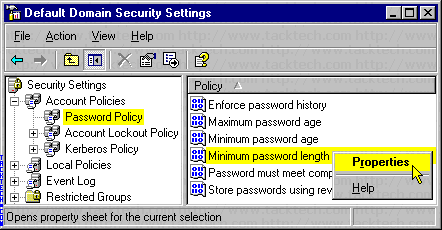 Click on Security Settings > Account Policies > Password Policy. 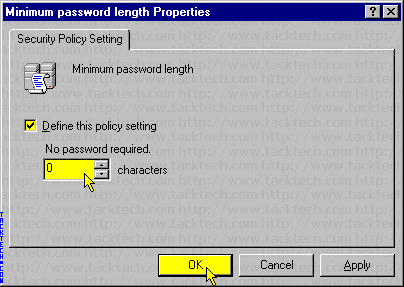 Right-click on Minimum password length in the right pane. 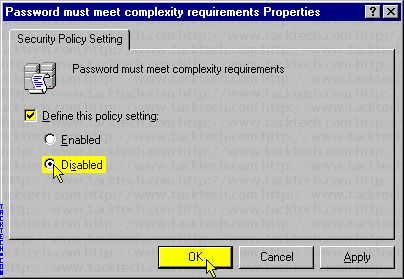 Do not remove the check from the Define this policy setting checkbox! Enter a new minimum password length. Entering a Zero (0) will remove the password requirement. Double-click on Passwords must meet complexity requirements in the right pane. Now, you need to put the new Password Policy into effect. Type gpupdate /force at the Command Prompt.